I think having friends is the most important thing in life. No matter how bad my day is going, having a friend around seems to make it better. Finding friends for my 14-year-old daughter Melanie (above right), who has Cornelia de Lange syndrome, has been an endless, exhausting and sometimes devastating, struggle. In nursery school, the whole class was invited to a birthday party—except Melanie! In Grade 2, Melanie was invited to a party, but bullied when she got there. Girls took turns pulling down her pants and laughing. There were so many difficult moments and painful realities that I didn’t want to see. In elementary school I figured out one-on-one play dates didn’t make sense. Melanie couldn’t communicate properly and had no idea how to socialize. So I'd invite a bunch of girls over at the same time. Over the years, these girls learned how to communicate with Melanie, understand her differences and even help with some issues like toileting. The girls were comfortable with all of it. They loved Melanie and loved coming over as a group. The hardest part was accepting that Melanie could never bond with the girls as well as they’d bond with each other. By Grade 5, our local school couldn’t meet Melanie's needs. So we placed her in a special program 45 minutes away. The program was designed for children with special needs. We were excited and curious to see if Melanie would bond with other children with disabilities. Within two years, Melanie made a friend at this school. But she lived far away. We tried a few play dates but the distance to get together was absurd. We'd drive three hours for a two-hour play date. Melanie would cry. She wanted to see more of her friend. The two girls were very comfortable with each other. They'd spend hours on the phone, which was amazing because Melanie can’t really talk. Melanie seemed more at ease and confident in her new classroom as well, which was a program for 10 children with special needs (as opposed to the full integration with an assistant she’d had in our local school). Then, in Grade 8, Melanie had numerous health problems. She was absent from school for almost six months. It was awful, lonely and depressing. No phone calls, no visits, no cards and no friends nearby. Her new friend lived too far away. Melanie was alone all the time. She seemed depressed for the first time in her life. It was heartbreaking. -Melanie needs to find friends, maybe peers with special needs, close by. 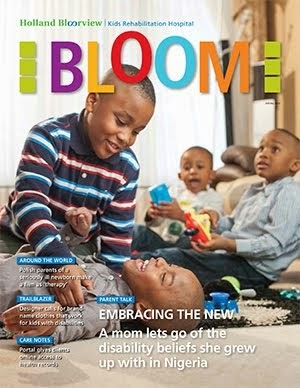 -As a family, we need to find a common activity that isn’t TV! We can't ski, skate or go swimming together, so what else can we do? -As a community, we need something for everyone: children with and without disabilities, teens, adults and seniors. We need inclusiveness and integration. Melanie enjoys being around people of all ages. After months of thinking and intense discussions, we had a plan. Last spring we started a hand drum circle in our basement with two other families—moms, dads and siblings. We found a teacher and bought some hand drums. After six months, we moved the drum circle to the Legion in our neighbourhood. And the circle keeps growing. By February, more than 50 people will join: old, young, teenagers, those with and without special needs. Everyone in our community is invited. The drum circles are a blast of energy and super social! We never imagined they would be this fun! Melanie and her brother Tommy have made new friends. My husband and I have made new friends (we needed some too!). Melanie was able to reconnect with her elementary school friends from the community. 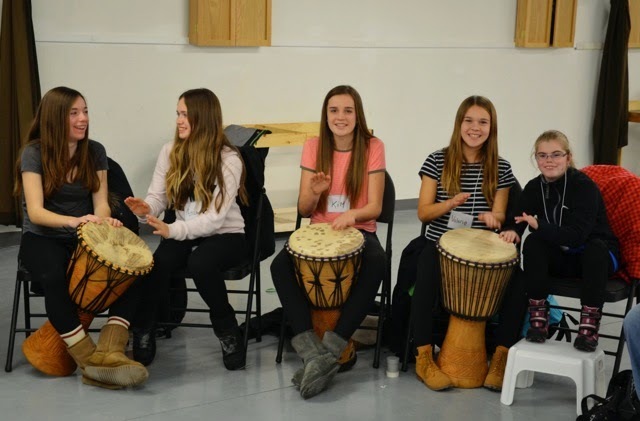 Last week, we invited the group of girls who used to come to our house when Melanie was younger to the drum circle. Melanie was ecstatic to see them! Melanie also gets to make new friends. 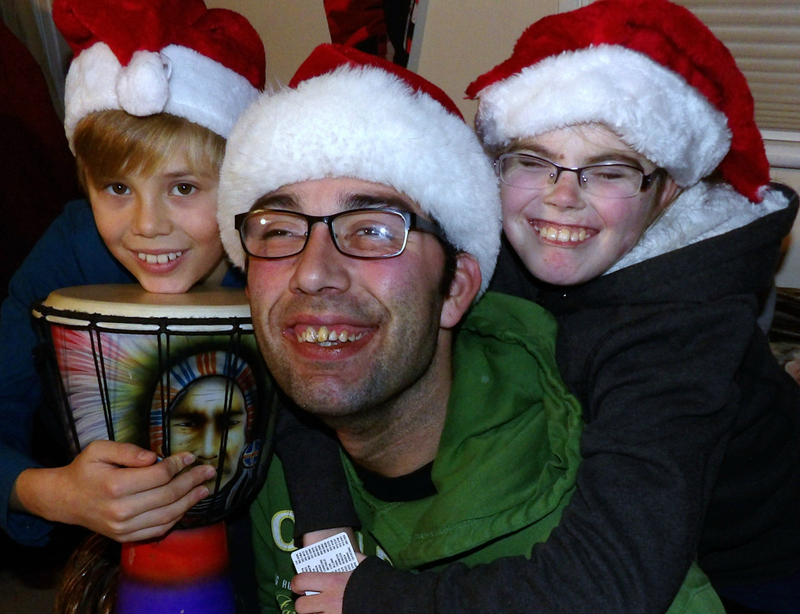 One is Rob, who is 31 and has cerebral palsy (above centre). He attends the drum circles on a regular basis. He also comes over to our house for dinner and watches Tommy (above left) play hockey at the arena. Melanie, Tommy and Rob have become good friends. They laugh so hard together that they can’t breathe! And that makes them laugh even harder. Nathalie Wendling is happy to answer questions about her drum circle at nats.wendling@gmail.com. You can follow the family at 2 Pet Rats, the website they created when Nathalie and her son Tommy wrote Melanie and Tommy Have Two Pet Rats and One Syndrome. Our daughter, Kara, is 31 and has made one wonderful friend. Her struggles are similar to Melanie's. They were both 20 when they met, and now they are 31. Still talk on the phone and visit every other year. We're in San Diego and her friend is in Phoenix. It took Kara most of her life to find her best friend. Your idea sounds like a great way to enjoy friendships. Is newborn euthanasia an answer to parent pain?